This sheet music illustration shows Manchester's Royal Exchange. It was first built in 1729 but it expanded and was rebuilt on a number of occasions. It was an important trading centre and for a time during the 19th Century about 80% of Britains trade in cotton and finished cloth was controlled by the exchange. 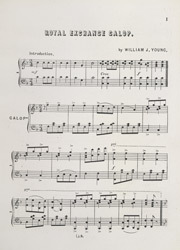 Music Hall songs were topical, and music was composed and then named after a current event, political situation or even in memory of an important person.